Radio Frequency Identification (RFID) is a means of identifying a person or object using a radio frequency transmission. The technology can be used to identify, track, sort or detect a wide variety of objects. Communication takes place between a reader (interrogator) and a transponder (tag). Tags can either be active (powered by battery) or passive (powered by the reader field), and come in various forms. Some variants of tags and readers are shown RFID Tag and RFID Reader respectively. The communication frequencies used depends to a large extent on the application, and range from 125kHz to 2.45 GHz. Regulations are imposed by most countries (grouped into 3 Regions) to control emissions and prevent interference with other Industrial, Scientific and Medical (ISM) equipment. 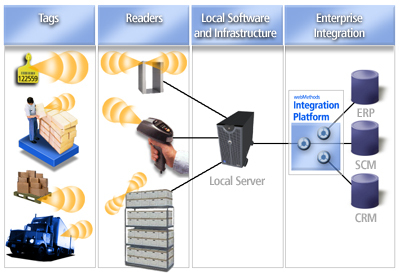 In a typical RFID system, tags are attached to objects. Each tag has a certain amount of internal memory (EEPROM) in which it stores information about the object, such as unique ID (serial) number, or in some cases more details including manufacture date and product composition. When these tags pass through a field generated by a reader, they transmit this information back to the reader, thereby identifying the object. The communication process between the reader and tag is managed and controlled by one of several protocols, such as the ISO 15693 and ISO 18000-3 for HF or the ISO 18000-6, and EPC for UHF. Basically what happens is that when the reader is switched on, it starts emitting a signal at the selected frequency band (typically 860 – 915 MHz for UHF or 13.56 MHz for HF). Any corresponding tag in the vicinity of the reader will detect the signal and use the energy from it to wake up and supply operating power to its internal circuits. Once the tag has decoded the signal as valid, it replies to the reader, and indicates its presence by modulating the reader field.